After pulling my hair out for the last 2 1/2 weeks chasing an engine knock that several other retired mechanics couldn't diagnose either, I finally found the elusive knock. Thursday evening I took the engine back out for the 4th time. (I am really good at taking engines out and putting them back in now) Friday morning I reread the thread on the forum with suggestions from other Model T people and slowly eliminated the ones that I knew I had tried. The thread from Kohnke Babbiting about twist, bend and offset of the rods seemed like a reasonable place to look next, so I called Herman Kohnke and visited with him about my problem. What he told me really made sense and he described my problem to a T. I only live about 3 hours away from his shop so told him I would pull the pistons and rods and see him about 11:45AM. Herman dropped what he was doing on other peoples projects and gave me a crash course on bend, twist and offset for connecting rods. Then he proceeded to work over my rods. One rod was really bad and it took about an hour to get it to his liking. (we were talking about Model Ts too) The other rods weren't as bad, but still needed some tweeking to get them straight and to his specs. I never knew that rods could be that far off and have never heard of any of the babbitt shops doing a straightening job on rods. Maybe they do and just don't mention it or charge seperately for the process. Anyway, I was totally impressed with Kohnke and his shop. This guy knows babbit and model T engines. Next time I do an engine Kohnke will do the job. I put the engine back together Friday nite and Saturday and put into the car on Sunday afternoon. When I started it up, NO MORE KNOCK! I'm curious as to how the rods had problems, did it happen while assembling, ie, twist while tightening wrist pin bolt. I check my rods, then pour and machine the big ends square to the wrist pins, now if others do that I don't know, but to look for and alter, not so much of the twist, but straighting a slight few thou bend after the the big end has been machined to align with the wrist pin, will alter the trueness of the rod, giving not solving problems. You can eliminate the problem caused when tightening the wrist pin bolts by putting a large screwdriver or other rod which will fit into the wristpin and either fasten the rod in a vice or lay it on a bench so that you are tightening against the wrist pin rather than against the rod. All babbit pourers should check for straight rods before they pour them. They can be twisted so that the pin isn't parallel to the crankshaft in several directions. One of the knocks caused by bent rod is that the rod will move front to back as the piston goes up and down, and although it is tight enough within the bearing, it will knock front to back. That will make a knock at certain speeds, especially low speeds. You can also get a problem with the piston being tight at the bottom on one side and at the top on the other side caused by the wrist pin leaning to one side etc. Not only will it make a knock, but will also wear out cylinders and pistons faster. Kerry, you said((but to look for and alter, not so much of the twist, but straighting a slight few thou bend after the the big end has been machined to align with the wrist pin, will alter the trueness of the rod, giving not solving problems.)) This is just simpley not true, as I see you don't under stand the process of straightening a rod, and this is just not Model T Ford, this is every rod, in every engine that was ever built. I am just guessing that you use a milling machine, to do your rods? There is no machine in the world that will machine a rod good enough to just put it in an engine with out checking trueness. While you can bend a rod out of alignment various ways, and using stupidity as your guide, these rods were bent from the maching process. Unless your rods have been run over by a truck, trying to straighten them before machining, is a waste of time. The wrist pin, and crank hole after machining is what you have to be concerned with. Twist, Bend , and off set. We use a piston vice to put in the wrist pin, and to take the rod caps off, we slide the rod over a shaft, about 5 to .010 thousandths smaller, and brake the nuts loose. Norm, as far as rebabbitters check rods for alignment, there are several the say, oh we don't have to, as the rod lathe cuts them straight. Checking rods for alignment is just as important as boring cylinders straight! Thanks Herm. Has anyone considered creating a CD or handbook on the basics of babbiting / line boring Model T Blocks and / or rods? I think it would make great reading even if owners had the babbiting done by a pro. Yes Herm you must be right, I don't understand, after 40+ years of engineering for me to think that I have 2 aligned holes on one shaft and then go and bend it some place in-between, I'm still going to be running true, mmm!! fool on me. Yes Kerry, your statement tells me you have no idea of what the rod alignment process is about. You may not beleave this, but when I was born, I didn't know S%$# either. As my Dad used to say, he knew of a 80 year old man that drove a Model T all his life, and he still couldn't drive. 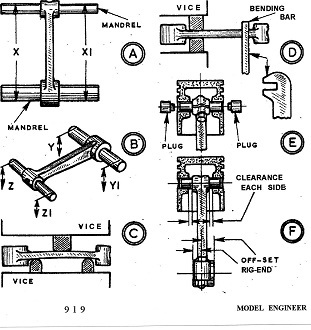 If you, or any body on here, has trouble under standing the rod alignment process, order a Model T, K.R.Wilson tool catalog, there is much reading, and it will explain it all. Kerry, even if the twist and bend were close, there is a 80 percent chance the off set is out, and that right there is enough to screw up a cylinder, Bring up rod alignment on the net, there is plenty to read. Herm. Yes Herm, We had a local machinest that was criticised by all in the trades for over engineering every thing he did, it was his way or no way but he proved to be right in the end, he retired with the millions of $'s I"m still working, but I can tell you I never have to do the same job a second time for free, it's right the first. t This is the simple thing of alignment you are trying to tell me that I don't understand, well Herm, I'm telling you, do any of those adjustments after the big end has already been machined to match the wrist pin alignment and that bigend bearing will no longer be true to the crank. After the final pass is made on the rod bore if you remove the rod and reinstall it flipped over and make a check pass this will tell if your setup is on the money. In my mind, this should work on what ever jig or machine you use. The off set is checked the same way. And if your still not sure, cut mandrels for the pin and bore. Bolt three or four ( I wish you lots of luck with the fourth ), finished rods on the pin mandrel and pass the rod mandrel through the bore. This little test will tell volums. I can tell you this, that no matter what you say, straightening the rod after the babbitt has been poured DID get rid of my knock. End of discussion, I am a b believer. I trust Kohnke and what he told me, he fixed my problem. Kerry, you have got alot to learn! Your last statement, is pure IGNORANCE! You guys are starting with a false premise that when a rod is machined, they are straight, THEY ARE NOT. There is no machine in the world that will machine a rod straight. Even if the twist and bend is close, or some times one, or the other, the off set can be as far as a 1/4 inch, and unless you put it on a accurate rod alinger there is no way to tell, and just like looking at a bent Model T pan, if it hasn't been run over by a truck, you can't tell it is bent, or how far out the pan is with out a jig. Let me add one thought to this heated discussion. IMHO, measuring for bend is meaningless unless the piston is installed on the rod. I also do all my measurements with the rod on the crank that will be installed in the car. I set the crank in a lathe and install the rod with a thin shim wrapped around the crank journal to hold the rod fast. I fashioned a jig to measure bend by referencing on the piston wall for and aft. Measuring both sides insures my jig is set up correctly and I don't get a false reading. If I get less than .003" tilt I figure I am good. I measure twist with the wrist pin installed but not the piston. Many if not most period rod alignment jigs also measured bend by reference to the piston wall with a horizonal bar at the bottom to hold the big end of the rod. There were different diamenter bars depending on the size of the rod. I figure using the crank that will be in the car with my jig insures the rod will be verical as installed. One more thing, I personally don't worry about a LITTLE offset, it doesn't hurt a thing. Bend is the big enemy. Although I sometimes get offended with the way Herm writes off ideas of others he disagrees with, I generally agree with the merits. Re his statement that you can't trust rods out of the boring machine to be straight, I completely agree. Before I did my own engines I had a number rebuilt by a well respected builder in N. Cal. Most of the time the rods were within my .003" limit, but sometimes they were out, on a couple occasions, way out. You need to check them. This prevents the rods for bending, when tightening the screws for the piston pins. Although Herm may be stating things in a slightly rough way, he is 100% correct. Straightening before pouring or machining is only of value if the rod is way off to begin with. Like maybe if a crankshaft broke and really bent up a rod. Otherwise, it's close enough. Straightening after pouring and before machining is impossible because there is no precision bored babbit to measure to. It is only after finish boring the babbit that you can see just how good you've got it and how much tweaking it needs. Kerry's inspection drawings are fine and are what should be done after the rod is bored. Kerry's assertion that adjusting the rod after machining will somehow result in poor alignment is not correct. Just simply machining the rod, no matter how careful you are, and blindly trusting the result, will not necessarily yield a good rod. Post boring inspection and adjustment of the rod is necessary to assure correct alignment and fit. Forget for a moment that we're discussing rods here. From the point of view of any precision machinist, you would never take your finish cut, remove the part from the machine and hand it off to a customer to use until you inspected your work. The same with connecting rods. You finish bore the big end to the proper diameter. Then you remove the rod and check it for bend & twist. You then adjust the rod to bring both big end & small end centerlines dead parallel to each other. If someone is skipping that last step then maybe they're lucky enough to finish bore the big end "close enough". I worked on an engine for a friend of mine a couple of years ago. His crank was .017 undersize. I had him buy a set of rebabitted rods, finish bored for a .030 under crank. I set the first rod up on my mill, aligning the small end with a pin set vertical in a V-block. I quickly discovered that I couldn't get the big end picked up such that it would clean-up if I were to bore the additional .014 I needed. Checking the rods, I discovered that they were all bent approx. .034 and twisted .017!!! This was as delivered from a well known, highly respected rebuilder. I will not name them. I corrected the bend & twist, bored them to fit the odd sized crank, then RECHECKED for bend & twist. I got them within .005 right off the mill. A little readjustment got them with .001. Good enough for my satisfaction. Jerry, why didn't Post this yesterday, and save me alot of typing. Easy to understand, thanks Herm. To reinforce what Herman has said . A customer came this past week brought us a T to rebuild and said his engine was knocking. We disassembled the engine together to see where the knock was and the overall condition of the engine. Needless to say the rods were bent to the point that the pistons were going up and down sideways. 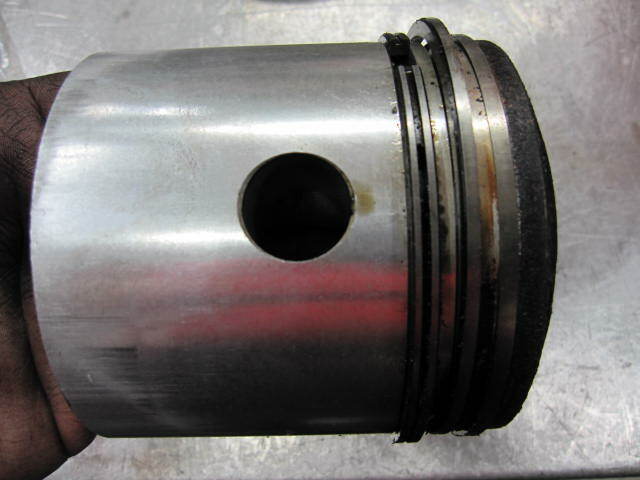 If you look close at the Pictures you'll see the Eyebrow on the side of the piston. You'll notice on the second picutre there isn't any abnormal wear pattern. While it's possible to twist a rod while tightening a wrist pin bolt, it's not the only way they get a twist, or a bend. As stated above, they can be "bent" & "twisted" right off the rod boring machine. Understand however that the terms "bend" & "twist" do NOT infer that the rod was actually deformed during boring or any other handling. Those terms are used to describe the kind of errors that commonly occur in connecting rods, even after they are newly manufactured. It does not mean that they were wrung around until the rod was actually deformed. It just describes a kind of error in such a way as to be more descriptive of the nature of the error. As in all manufacturing procedures, there is error. That's why there's such a thing as tolerances to describe how much error is acceptable. 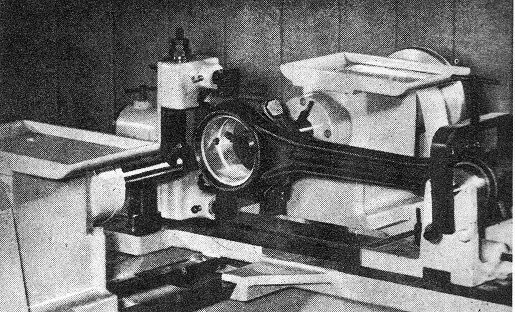 The error experienced in rod boring must be inspected for and corrected, if needed, to bring those errors within the accepted tolerance. One of our sister companies did pre-production runs of connecting rods for automotive and diesel truck engines. Their inspection procedures, among other things, routinely checked every rod for bend & twist. Just having come off a "precision" CNC machining center was not a guarantee of a good part. It's said so often before, but you really learn things reading this forum! If a rod is out of alignment coming off a rod boring machine it would seem to me that the set up is not rigid enough or the rod is being twisted when it is clamped in the machine. I believe virtually all model T rods have some twist and this is the reason rod journals are very often found tapered, bid in the middle and small on the ends. It would seem to me that rods should be checked for straightness prior to re-babbiting and machining. Jerry, do you want to try again?? Herm. Some have missed my point, if presented with a set of rods like Herm was, and they have been machined so the mandrels check out to be square (A) but later look to be bent on inspection, so the rod is then straightened as in figure (C) and then tell me that the big end is still true to the wrist pin, at this stage I still don't by it, my original question was how they became out of alignment from the start, twist I can understand, bent and machined to be square, this is were my ignorance comes in as Herm as posted twice. So enlitten me from my ignorance and tell me how if you are given a rod and you change the geometry of it from the middle and still maintain it's trueness at the ends. Now, if you told me that the the mandrels were out on the first check because of the style of machining and you bent the rod to run parallel, fair enough, but starting with a straight rod gives you a finished strait rod. I will try to answer your points below. I will make my responses in [CAPS], not because I'm "yelling" at you, just to highlight my comments from yours. Again, no temper here. at this stage I still don't buy it, my original question was how they became out of alignment from the start, twist I can understand, bent and machined to be square, this is were my ignorance comes in as Herm as posted twice. [THE RODS COME OUT OF THE ROD BORING MACHINE WITH BEND & TWIST ERROR. THE MACHINE IS NOT PERFECT. IT DOES NOT MEAN THAT THE RODS ARE LITERALLY BENT & TWISTED. AS I EXPLAINED IN MY POSTING ABOVE, THE WORD "BEND" DOES NOT MEAN THE ROD HAS BEEN BENT, AS IF AN ELEPHANT STOOD ON IT. IT MEANS THE ROD HAS ALIGNMENT ERROR MAKING IT LOOK AS IF IT HAS BEEN BENT. IN REALITY, IT HAS SIMPLY BEEN BORED LESS THAN PERFECT. SAME IS TRUE OF THE WORD "TWIST" THE ROD HAS NOT LTERALLY BEEN TWISTED, IT'S JUST THAT THE BORING ERROR MIMICS A ROD THAT HAS BEEN TWISTED. DO NOT TAKE THE WORDS "BEND" & "TWIST" LITERALLY. So enlighten me from my ignorance and tell me how if you are given a rod and you change the geometry of it from the middle and still maintain it's trueness at the ends. [YOU'RE NOT STILL MAINTAINING ITS TRUENESS, YOU ARE ESTABLISHING ITS TRUENESS. GET IT OUT OF YOUR HEAD THAT THE ROD BORING MACHINE PRODUCES A PERFECT PART. IT DOES NOT. IT ONLY GETS IT CLOSE. THAT FINAL ALIGNMENT IS DONE PER (C) & (D) IN YOUR TABLE ABOVE. The problem that started this thread was caused by someone who bored a set of rods but did not check them per (A) & (B) above. They could have never checked o.k. They were used as-is. Had they been checked, it would have shown that they needed "bend" & "twist" correction per (C) & (D). If they had been corrected, (as they ultimately were by Herm), none of this mess would have happened. Hence, the need for post boring inspection and correction. You seem to have it in your mind that somehow these rods were good to begin with and adjustment would only cause misalignment. They clearly were not good and post machining alignment corrected them. "It would seem to me that rods should be checked for straightness prior to re-babbiting and machining." You can check them then if you want but it will have zero influence on the end product. It does not matter if the large, UNBABBITTED, rod bore runs true to the wrist pin bore or not. It only matters how true the finish bored babbit runs to the wrist pin. The pre-existing condition of the rod does not matter, only the finish bored babbit. Kerry, the rod boring machines I have seen index off the wrist pin hole. In theory, it really doesn't matter if the rod itself is bent at the outset since the big end is bored so that it is parallel to the wrist pin hole. Offset might still exist but there should be no bend or twist, as that term is used. Sure the body of the rod may well be bent, but so long as the two holes are parallel, it doesn't matter. Again, I am not addressing offset. So if that is the case, how do you get bend or twist? One example. The wrist pin hole is clamped to the wrist pin when installed in the car. The clamping process may cause the hole to collapse unevenly resulting in the wrist pin being out of alignment. Another example. Clamping the big end in the rod boring fixture may cause the big end to move a bit and become misaligned with the wrist pin hole. In theory, a rod that is bored by reference to the wrist pin hole will be aligned. But in practice, many things can and do cause problems. I recall a friend of mine built a rod boring fixture and it looked great. Problem was the big end was not clamped securely and the cut produced a tapered hole. It doesn't take much of a problem to produce bad results. Kerry, may be the word Ignorance is maybe to harsh a sounding word in some circles, meaning in one word uninformed. I was not pointing out some mental statuses, or at least until you under stand Rod Alignment. With that said, I haven't had success with posting pictures on here, but I must have several hundred on the Ford Barn, in my profile, there about 20 Albums. In some of the Albums, I show checking rod alignment, on the machine it's self, and the rod press, that does the twisting, and bending. Ok, now to your Questions Kerry. There is no way that any body can look at a finished rod, New Machined, or other wise, held in your hand, and tell if it is right or not, that is why the rod aligners. The print you have showen, is some what miss leading, as it does show what you should end up with when you have the rod aligned. The other pictures like No. 3, shows a way to bend a rod, that is also a crude way to bend a rod, and they are pushing in the wrong place that you would normally. The kind of bend showen, is not used in alignment, only in a damaged Rod. It might look bent, and be 100 percent straight, or out. As far as bending a aligned rod out of alignment, the rod machine will tell you if it has to be moved, like I said your false premise started when you though your rods were stright, when finished machined, it just don't work that way. Some one said they they don't worry about a little off set in the Rod, Man, that is just as important an centering the crank so when it expands forward, the Rods don't hit the piston Bosses. 80 Percent, and higher the off set in the rods are not usable, until fixed. Kerry, I am not expecting you take my word for it, just thought you may want to know how it works, there should be plenty info. on the Net, do your home work, and we will talk again, or if you have more Questions. Herm. The problem with trying to straighten a rod before pouring is, if there is no babbitt, it is just a rough, inaccurate hole, and if it has babbitt, it is just an inaccurate hole, more then likely, it will be made worse. Herm. Darn, Jerry your good! Very well said. I guss I won't be writing any How To Do Books, in the near future. Herm. Yes, thanks, all making sence now, as to the way of some tooling, I hope you can see why of my curiosity of my question in the first place as the only way I have seen, as Richard has posted, is to start with a straight rod, wrist pin tooled to a alignment mandrel, rod clamped and the big end tool bar squared to the wrist and machined. This thread has been informative and very relevant to what we have experienced recently. 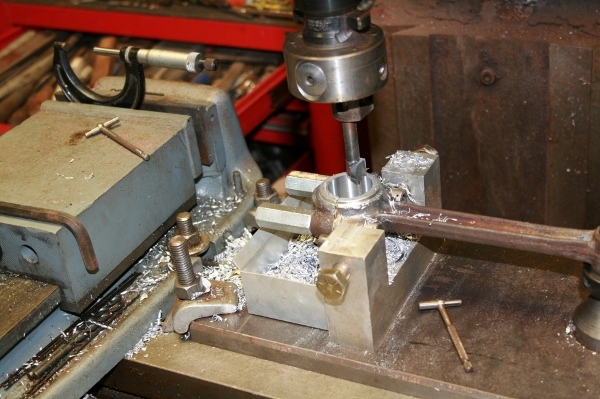 We have been doing rod bearings with success and our spin pouring process has been very much improved by Herm's input. We have just learned about some problems with rod offset issues. We align all rods after boring on the rod lathe, this is mandatory no matter what your boring process. We use a KRW alignment fixture. The problem is it does not address offset problems. We do a pre babbit pouring rough alignment check on the KRW rig using the rod bolt holes as a reference point with success. It identifies rods with gross alignment problems that can be corrected or scrapped prior to pouring. The problem is, we did not consider offset problems in the process. At this point, my question is how to correct offset problems in rods that have already been bored? I will check out Herm's Ford Barn pages to get info there. Any other input? Erik, The wilson Rod aligner will do off set, may be the little bar on the side, may be gone. There is a hole in the casting where the pinch bolt is. If you need any more info. just call. The last thing, all of the K.R.Wilson rod aligners I have had, about 25 to 30 of them have been out a little, but if you don't want to have it re scraped, you can compensate, but it would be better to have it trued. Unless you are going to only do standards, you will have to make many mandrels, I had done that about 38 years ago, but we only use it to break rod nuts loose, there are a lot better machines, and if you will be selling rods, you will need one. Herm. I have the little bar on the side, I can see now how to check for offset, thank you. I have made enough mandrels to align all sizes of rods down to 30 under. We rarely make them that small and never smaller. I use a Sunnen alignment gauge for everything else, but T rods won't fit on it. What other kind will accommodate a T rod? Thanks again for the info. Can some one post a few pictures of the Wilson or a better setup ? I would like to understand how they work. Herm, how about a link to those galleries at the Ford barn? I'll chime in one more time. If the rod is twisted or bent prior to rebabbiting, then when placed in the rod boring fixture it is likely to be moved one way or another. Then after the rod is bored and removed from the machine it will spring back and be out of line. If you just grab the rod, rebabbit it, and machine it, it will as Herm indicated, need to be straightened after machining. Ya, Ted, if you clamp a rod in a rod machine, just like you said, the machine clamping can by all means put a rod out of alignment. You have to make sure on every rod, that when you release the rod clamping, you can not see the rod move, or you have to reset, until you can't see the rod move when the clamp is tightened. Now with that done right, you still have the problem with the rod boring machine not boring in perfact alignment, none of them do, except by accident. One thing, do not think in very large terms, as how far off the alignment is off, as we are working with thousandths here, BUT they are to far off to put in an engine, even if you can't hear the knock, it will be wearing the cylinders. 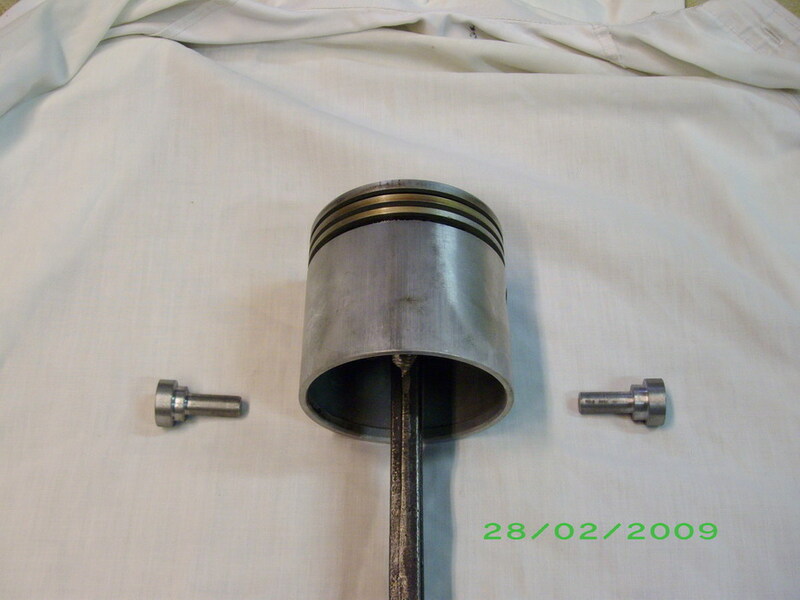 The rod should make the piston travel stright in the cylinders, and the rings make the pistons float in the rings. Herm. Herm, is this the type and style of rod machine you refer to as not being able to do the job it's designed to do and rods will need re-setting? Michael, I tried to get a link, but it is not working for me. So I think you have to Register. Any way Click on Kohnke Rebabbitting, then Quick Links, Profile, and then click on Show All Albums. There are about 21 Albums there, and some engines, like a 4 cylinder, 2 cycle Aplax engine we done this summer, and alot of our shop tools and machines, spun poured Model T rods, Aluminum Rods, and mains out of a 1923 Franklin I am about done with, and many others. Thanks Herm. I have had three different kinds of Rod checkers and I don't see how you could possibly straighten a rod on one until it is rebbabited. Most of the rods befor babbiting have most of the babbit gone or have big chunks of babbit missing. HOW ARE YOU GOING TO CHECK ONE OF THOSE RODS????? You guys that are recommending that must know a lot more than I do. Listen to what Herm is saying, he does more rods than every one that is arquing with him. Visit his shop sometime and see him push his shopping cart in full to the brim with rods to be pored. He told me one time that he likes to do 300 rods at a time. If you see that and are not impressed I don't what would. Again listen to what Herm Kohnke says, He has the absolutly best rods in the business. I thought I would show one of my rod checkers. This one is a KRW checker that checks not only T rods but A rods as well the small device on the left goes over the wrist pin and checks not only for twist but also for bend. I also had a steven's that I liked even better. 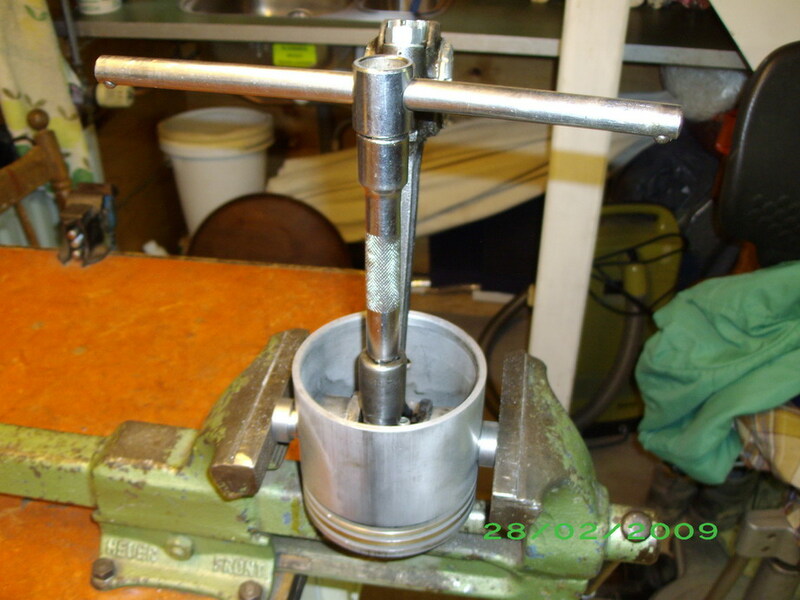 I am headed for the hills tomorrow in one of my Ts but if I have time I will take a picture of my piston vise. Sorry Dave, not arguing, just told that, have no idea and ignorant to the ways of rod work, so just trying to learn more. No, Kerry, I didn't say they couldn't do the job they were designed to do, as resetting before you bore to make sure the Jaws don't push the rod in any form of movement, You bet your sweet BIPY. Then when you get done boring the rod, you finish the alignment job on a Storm Vulcan, I don't know what the cost now, but my last price sheet said in 1996, the aligner was 4600.00, and the Storm Vulcan rod press was 3327.00. You have to have both. I got my machines when I was about 22, used, and sent both the the Factory to get checked, an or rebuilt. The Storm-Valcan is the best I have found, and they go small enough to do Model T's. Your picture looks like it is out of an operators Manual, or an add. Read your first posting on this thread! "There is no machine in the world that will machine a rod good enough"
So lets say theres not, like I answered Dave I would like to learn some more. solving Toms problem was great, someone had done the wrong thing. say we do a T rod your way, pick up a rod, doesn't look to bad, but we work on the fact it will be bent and twisted as you have stated, clean it up and re-babbitt, now the machining are we squaring up the tooling to the bolt holes? and disregard what the small end is doing at this stage? Just remember if you start filing caps or rods you change the center of the large end which not only weakens the rod but changes the amount of piston travel up above the block. Darn, never a short answer! You have the two questions on the bottom line! now the machining are we squaring up the tooling to the bolt holes? If you can see the rod is way off for twist, you can visually check the rods for twist, and get them closer, by putting them in the machine, and putting a round flat say, doughnut, that is 90 degrees to the shaft, and push the rod up to it to see if the clearance in gap is the same on both sides, and I am talking about that machine in your picture, I have two of them left. For bend, you can see if the over gap at top and bottom is the same, and that will help fix a damaged rod before pouring, because as Dave said, a rod aligner will do you no good at that point. Also make sure the aligner is true, as a machine can change all by itself for accuracy! and disregard what the small end is doing at this stage? Not much to do with the small end at this point, out side of using it to change the gap I was talking about. Herm. You don't change the center to center distance by filing, especially if you're only filing the cap. The centers are where you bore them, regardless of the cap mating face. Also, you don't file the rod, you file the cap. You don't file it much either or you end up with a cap that ultimately has thin babbit in the bottom end. Which is why, as you state, some rebuilders don't like caps that have been filed a lot. I could not imagine anybody filing a cap, or a rod for that matter, enough to change its strength. If you file the cap too much you would have to change the center to center distance, otherwise you would have No babbit in the bottom center of the cap. Anyway I would never file a cap or a rod. I meant to say, but forgot, I believe that the cap should measure 15/16" I may be way off on that I would have to mesure some to be sure, I never had a good memory and it is not getting any better. Again on the subject of rods maybe some of the new guys don't realize that they should have balance rods. There was a guy near Denver that used to be by far the number one guy to do rods in Colorado. His rods were so out of balance that it was impossible to balance some of them. I had a set one time that not only did I grind the ridge off the bottom of the cap but drilled holes all the way up the center of the stem just to see if I could balance them. They still would not balance. I kept that rod as an example. When you get a set of Kohnke Rods you will find that they are balanced so close you can not find any diffence even with a balance fixture. "If you file the cap too much you would have to change the center to center distance, otherwise you would have No babbit in the bottom center of the cap." Yes, that's what I said about the cap. However, nobody would/should think of altering the center distance to suit a messed up cap. It appears to me that the average guy would have trouble aligning rods properly without haveing the proper equipment. I built a simple setup years ago but now wonder if its close enough although I have a good understanding of alignment. There is lots of work with rods beyond new babbitt equalizeing the ends usually smoothing one the other or both as they are usually way off. Paul, if you have a lathe, there is an easy way to check for bend, twist and offset. If interested, send me an email. Before or after, at the end of the day I still see the same resalt, the only thing that worries me is that if I try to do any aligning after, that I might damage the new babbitt. The checking of the rod before pouring and machining, I don't see it as rocket science, I disregard the cap untill machining, bolt the rod to the bearing mold, a very nice piece of engineering from Gene French, who also makes a nice mains line borer, square it to the big end bolts, that gives you a bottom mandril and refit a piston pin for the top mandrel. I have followed this thread with a good deal of interest and have learned a good deal. What amazes me is that what did they do "back in the day"? Henry was turning out how many cars per day? couple thousand up to nearly 4K plus near the end of production. Did they pay that much attention to this then. Didn't care. or have some lost art that was used back then. Or are we building engines far better now then they did then driving them off the factory floor. I know Murray Fahnestock discussed a knock just like this due to rod alignment in the Ford Owner. By balancing and aligning things in ways they were not able to back in the day we have smoother stronger longer lasting engines. Are they better than factory originals? That's why you bend and/or twist the rod in the beam area, like your diagram shows. Doing that won't hurt the babbit. A normal Model T rod on a rebuild, we would use 2 .032 thousands solid shims, and 1 .032 thousandths laminate. With that amount, the castle nuts would line up with the key holes perfact. There were a lot of Model T rods that were filed both sides when in use. I had tooling made for the mill, that cost 3,500.00, just to surface both sides. we used to do it with a 16" half round corse file, but that would take about 15 minutes, and my girl friend who worked for me for 20 years, said if I didn't find a easier way to do it she was not going to do them any more. So I let it go for a while, until she through me down the basement steps, and through the washer, and dryer on top of me, I drew up the plans the next day, just on survival instinct alone. When you mill the part lines, it is a must to center off the bolts, (All the bolt Area), or the rods will not go togather Flat on the part lines, and as you tighten the rod caps the rod will twist to meet flat, and stress the babbitt, and the Rod WILL FAIL. There are many shops today that set up with a cap to far ahead, and bore out the caps, NOT GOOD, it will weaken the caps, and Really mess up rod weight, if you are going to balance. Center distance should never be taken from a rod, unless you don't know the measurement. The center distance should be set on your rod lathe, as the rules on them are also not right on either. Dave, your measurements on the caps are about right, the shorter it gets, the more shims you have to use, and the wider the broach groove. gets. On balancing Model T rods, I drill the Big ends, and wire weld the small ends, bringing the lightest to the same weight as the heaviest. Herm. If you hurt the babbitt in the alignment process, your babbitt was going to fall out any way, best to find out now! One thing, the know how on the machines, that make the machines, really hasn't changed, it has been refined, but not changed, still basically A mill. From 1920, just more bells an whistles. Ford checked alignment of ther rods, seen it in the old films. Herm. A couple of notes here. I agree that you must align rods after boring no matter what the method. I use a Hempy Cooper rod lathe. They sometimes require no adjustment, but often a little tweaking to get perfect. I made some tooling to pre check alignment of the rods before pouring to catch badly deformed rods and correct so as to keep the bearing thickness uniform in the rod when bored. I have a mandrel for the KRW tool that goes in the wrist pin end of the rod, effectively placing it on the machine upside down. 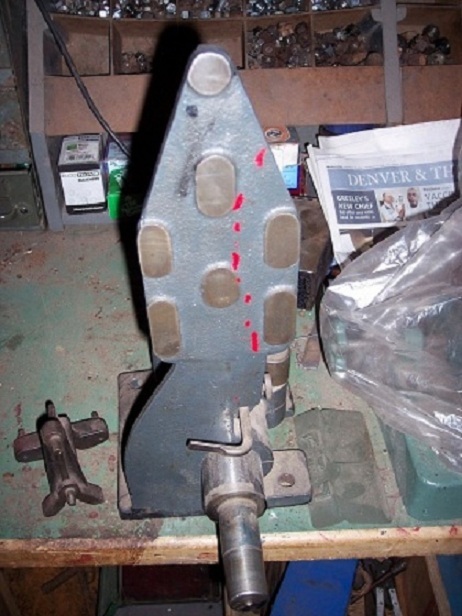 I then use a gauge that registers with the rod bolt holes to check for bend and twist. This just gets the rod in rough alignment and is no substitute for checking after boring. I can put up pix in desired. I have thrown out a lot of caps and rods that have been so butchered with files and sanders that they would result in too thin a bearing and weakened parts. On the issue of balance, I do rods in large batches of 50 or more so I can arrange sets in closer balance. I balance both large and small ends, not just total weight. I use a MIG welder to add just a little weight when needed. There is little area to remove weight from a T rod without compromising it. The little added extra weight is insignificant compared to the weight savings of the late style rods and aluminum pistons. I am working now on dealing with some offset problems on a few rods, never watched that closely before. Still learning from the forum. I was interested to read that you use 3 x .032" shims on each rod. I can see the logic of using a laminated shim for later adjustment of clearances. Are the two solid shims used to restore/ compensate for filing on the caps in the past? I do not do my own white metalling. My man had me measure the rod caps and any which were under .650" were rejected as having been filed down too much. After melting out the old babbit material, he had me match weigh the four caps and the four rods. By mixing these, I could come up with a reasonably well matched set of four rods and caps. This preparation before re-metalling save a lot of grief when balancing the completed rods. I'm not trying to start a war, but I do not understand how a rod can be out of alignment after it is bored unless the jig or machine doing the work is set up wrong. If you check a rod in a jig or one to another and find it screwed up you got to know something ain't right, and it looks to me that it would be a lot easyer to fix the problem once than do each rod . I like your micrometer holder. You are right Allan, it takes that many shims, In Most Cases, to push the cap out to the same position, with Ford Rod bolts, and nuts as when the rod was new. Any more shims then that, is not practical. I have rebuilt several sets over the years, for oil pressure, by building the part lines up with brass, and machining them so all the shims that we put in are .006 thousandths, because on a pressure system after .006, the rods should be rebuilt any way. Ok, Bob You should go back also and read Jerry's posts, that should help. The fact is when you set up yout rod, in what ever you use to bore with, unless some thing moves, and you did a good job, there is nothing else you can do to control the out come. There are many factors that predict the out come, in all rod machines. Deflection in the bar, in your case, head to table, quill wear, Clamp deflection ect. 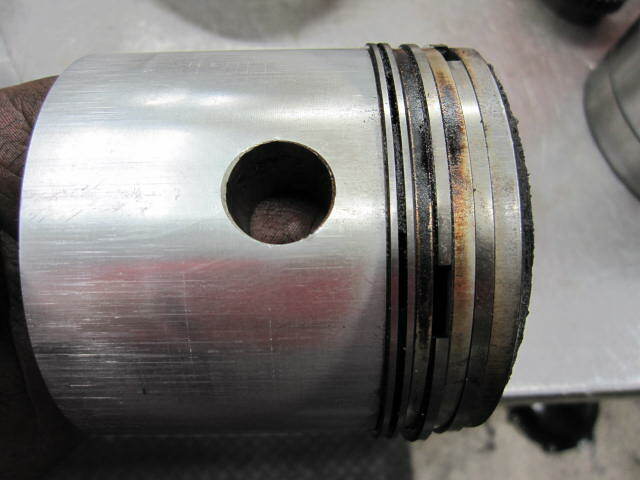 Do not think, in feet, or inches, we are talking thousandths, for every .001 thousandths off, the rod, and piston wear will suffer, plus the cylinder. If you checked the Ford Barn Albums, you will see the machines I use for rod alignment. Just ask your self, why would any companys make thousands of rod alignment machines if the rods would be ok. I see you are using snap gages to check bore, they will not get you to the 1/10 of a thousandths, as they are not consistent in reading, if you want that, use a 1" to 2" Post mike, and then out side Mic like you are doing. They will give you the same reading every time, and always an exact size.40 years ago, I messed up alot of different kinds of work, with snap gages, and had to do it over, I thought it was me, and we all know that wouldn't be true! Herm. We could always go back to the way of Henry,s micro fitting, Burnish. I was thinking about that Kerry. Ford used a large electric motor to drive the crank burnishing it while dumping oil on it. Guess some of the late cars with insert bearing have the large end cast as one part then split, you can not exchange rod caps. Ya, I guess, if your gona put in crooked rods to wear out the pistions, and cylinders, you just as well use that out dated, proven bad technology also, and Burn the bearings up also. At least your motor rebuilding adds would be good conversation pieces. I don't think Ford "burned in" the rods, that was just the mains. Maybe I am wrong about that, but properly bored bearings do not need to have that done. T rods are about as rigid as cooked noodles. When you secure one to a boring machine, things flex and move. They must be aligned after boring. You would think that boring them on a machine that indexes them off the wrist pin hole ensures perfect alignment, but it just is not so. If you have the means to babbit and bore rods, you should be able to align them. Bob, I like your boring fixture. Thank you Mr. Kohnke, I hope you have someone to pass on your knowlege to. This was a very good thread for all of us shadetree mechanics to ponder. Keep up the good work!